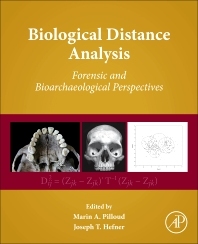 Biological Distance Analysis: Forensic and Bioarchaeological Perspectives synthesizes research within the realm of biological distance analysis, highlighting current work within the field and discussing future directions. The book is divided into three main sections. The first section clearly outlines datasets and methods within biological distance analysis, beginning with a brief history of the field and how it has progressed to its current state. The second section focuses on approaches using the individual within a forensic context, including ancestry estimation and case studies. The final section concentrates on population-based bioarchaeological approaches, providing key techniques and examples from archaeological samples. The volume also includes an appendix with additional resources available to those interested in biological distance analyses. Case Study 1: Do Global Patterns of Cranial Shape Variation Conform to the Predictions of a Neutral Model of Microevolutionary Expectation? Case Study 2: To What Extent Can Global Patterns of Craniomandibular Variation Be Explained by Variation in Subsistence Strategy? Dr Pilloud is an assistant professor at the University of Nevada, Reno. Prior to this appointment she was a forensic anthropologist at the Defense POW/MIA Accounting Agency. She is a Diplomate of the American Board of Forensic Anthropology and a Registered Professional Archaeologist. Dr. Pilloud is currently the co-editor of Dental Anthropology and serves on the editorial board of Scientific Reports. Her research interests focus on the human skeleton and how it can inform our understanding of human behavior in archaeological contexts and also be used in a forensic context as part of the biological profile. She is particularly interested in the application of dental morphology and metrics to answering research questions in both of these realms. She has active bioarchaeological research programs in Neolithic Anatolia and prehistoric California, and regularly consults with law enforcement agencies to complete forensic anthropological casework. She has numerous publications in peer-reviewed journals and edited volumes. She is also the co-editor of the volume Biological Distance Analysis: Forensic and Bioarchaeological Perspectives. Dr. Hefner is an Assistant Professor of Anthropology at Michigan State University. He received his PhD from the University of Florida, Gainesville. Dr. Hefner is considered one of the world’s foremost experts on macromorphoscopic trait analysis and the estimation of ancestry in forensic anthropology. His research interests include: human variation, skeletal biology, forensic anthropology, quantitative methods, human osteology, human anatomy, nonparametric statistics, geometric morphometrics, categorical data analysis, and classification statistics.